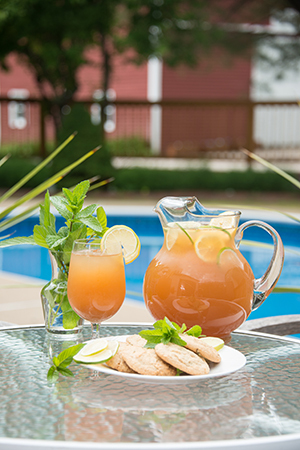 Featured for the 2013 Inn to Inn Herb Tour, the Inn’s guests enjoy this refreshing iced tea often during the warm summer afternoons. Bring 4 cups of water to a boil. Add tea bags and mint; cover and let steep for 10 to 15 minutes. Combine remaining ingredients in a 2-quart pitcher. Stir until sugar is dissolved. Remove tea bags from tea mixture; add to pitcher and stir well. Chill. Serve over ice. Makes 2 quarts.